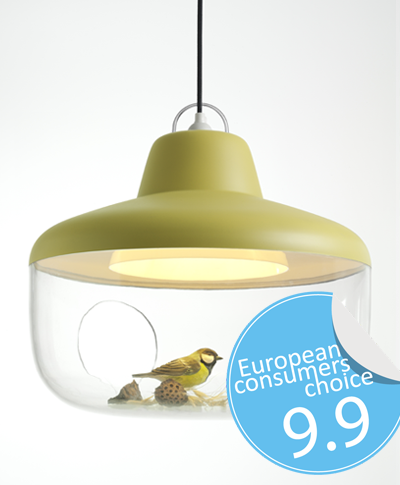 Our pendant lamp “Favourite Things” has recieved the 2011 European Consumers Award. We are glad to see that our dear lamp is also very dear to so many of you. And as designers we can not be proud enough to note that it was the first product ever to recieve a 10 out of 10 score in the design category. These are the scores – and the very kind words – from the jury. Voila! “Designers need to devote as much thinking to lamps as they do to chairs. All new products often adopt old codes and structures or run the risk that their innovation proves utterly non-functional. This object has never been seen before, is easy to install and showcases your very own favourite treasures. Possibly one of the most innovative and interesting creations of 2011”. “Must be seen to get a sense of the impact. In fact you see the object displayed under many different angles. You rediscover day to day objects and can easily change your decor regularly”. “Good ideas are where you immediately think « that should already have been created ». The « Favourite Things » should have been invented a long time ago and is therefore a superb idea. This product is not only beautiful and amusing, it brings theatre in the home where you can direct your own lighting and expand the work of the designer”. European Consumers Choice is an organisation created to reward European companies who have taken the challenge to produce innovative, intelligent designs and provide added value and ease of use of their products.